You can see the six B&T patterns by looking at the “siding” of these two campers. Great fall colors and a variety of patterns including…fish net, stripes, funky gears, tin type ceiling tiles, spiders, and an elegant black based paper with lovely fleur designs. Do you see the fishnet stocking “lamp”? Who’d have ever thought of a fall paper being used for Christmas! Can you see the spiders – very subtle. Not nearly as subtle as the dead tarantula I saw outside of work this week. View more of this NEVERMORE kit here. and next a little Scandinavian touch with our Christmas papers. Again, the “siding” shows all six B&T patterns of the White Pines paper packet. Don’t some of these papers look like they should be sweaters or mittens? The chevron pattern – it could go with so many themes and papers! The snowflakes on Cranberry will be beautiful for treat tags, cards, and Christmas memories. I love the sprays of berries and pattern leaves – very elegant country. The tan with white trees (pines?) could be used for country, fall, or any thoughtful project. The Glacier blue diamonds paper is another anytime anywhere option. 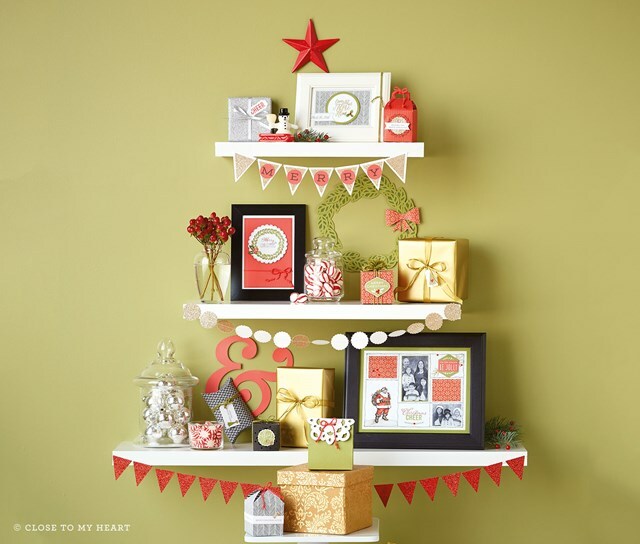 The tan tree on the bottom right is pretty holiday-centric and is cute! Now look at what all comes in the paper pack and some coordinated products. These are too dern cute! Look how many stickers and decorative supplies you will get to play with! White Pines, it is just too cute! Where can you find these papers and coordinated supplies to buy for yourself? In the Holiday Expressions Idea Books. Be watching for more Tiny House/Vintage Camper Paper Pack breakdowns soon!